As Blyth approaches manhood in the Celtic village which is all the world he has ever known, all he wants is a quiet life. When his father returns from distant lands, events force him and his brothers to flee from home. Guided by Gwenn, a powerful mage, their journey leads them across a continent and face to face with the might of the Roman Republic. 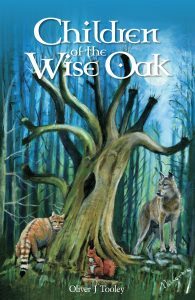 First in the “Wise Oak” series. Blyth, Teague, and Abbon return to their studies while Gwenn is sent back to Rome to keep an eye on a young patrician Gaius Julius Caesar. However, her magic may not be enough against the charismatic Roman, and soon she needs help from her friend Epona. While the two women agree on the merits of Roman wine, they disagree about almost everything else and Epona leaves. Soon, Gwenn finds herself enslaved to Caesar, and captured by pirates. Has she bitten off more than she can chew? Can Epona rescue her? Still grounded in real history, with a good dose of magic and at least one dragon, book two in the Wise oak series also passes the Bechdel test with flying colours. Article in the North Devon Gazette, 14th July 2016. 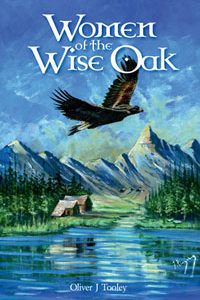 The Wise Oak series begins in the sleepy provincial island of Pretan, in the unimportant village of Ba-Dun. Three boys Blyth, Teague and Abbon are forced to flee for their lives; first to their mysterious great grandfather who teaches them magical powers, and then across the sea to Gaul where they continue their learning. Is it enough to prepare them to face the Romans in their capital city?